What's the best angle for my solar panels? There are many factors that affect the performance of your solar energy system, including how sunny it is where you live, which way your house faces, and even the pitch of your roof. Ideally, a fixed, roof-mounted solar energy system should be at an angle that is equal to the latitude of the location where it is installed. However, pitch angles between 30 and 45 degrees will work well in most situations. Overall, the angle of your rooftop has less impact on solar panel performance than the direction your roof faces. Regardless of where you live or the tilt of your roof, adopting solar power provides significant savings. The angle of your roof actually has less impact on solar panel performance than the direction your solar energy system faces. Optimal electricity production occurs when solar panels face south at a tilt equal to 30°. 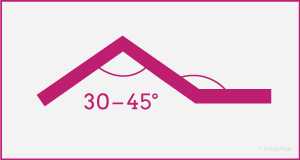 However, even if you lower the tilt of your roof all the way down to 5°, production only decreases by about 10 percent. 30° pitch angle – Washington, D.C.
5° pitch angle – Washington, D.C.
As you can see, if you live in New York where electricity costs 18 cents per kilowatt-hour (kWh), decreasing your panels’ tilt to 5° will lower production by a little over 10 percent. Although this decreases your optimal annual savings by about $120, you still save nearly $1050 per year. Because you live in a high cost area, your savings over time will grow even more as electricity prices continue to rise. In Washington, D.C., the production decrease is slightly greater because the city is further south. However, since electricity prices are only around $0.14/kWh, the economic impact is much less—your annual savings only decrease by about $90 per year. Annual savings in D.C., despite the 5° tilt, are still in the range of about $800 per year. In addition, property owners can often find additional savings through federal, state and local programs that offer incentives such as tax breaks, rebates or solar renewable energy certificates (SRECs). The main point to remember is that even if your solar panels aren’t installed at the perfect angle on your roof, they can still deliver significant financial returns. Assessing how the different performance variables will affect your financial outcome can get complicated. The EnergySage Solar Marketplace will help you to get multiple quotes from pre-screened installers in your area, and then automatically calculate the financial benefits each options provides. This process makes it a lot easier to find the option that’s best for you.